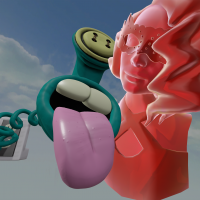 I have successfully posted sculpts to my gallery and to facebook a few times but for some reason now, it says that it posted to my uploads, but they don't show up in my Oculus Medium Gallery or on Facebook. the last one I got to work in my Gallery was a sculpt titled "balloon box" which has several strings and lots of confetti in it. The "3D Post" would crash my facebook app whenever I scrolled to it (which also happened to a few of my friends) so I had to delete the 3D post and just post a link to the sculpt in my Gallery. I don't knw why I suddenly can"t post to my gallery, and I hope it's not related to the baloon box facebook poat being wonky, But I hope to be able to use my Gallery again soon. Generally speaking only very large sculpts or unstable internet connections cause the share itself to fail. We are investigating why the posts are crashing the mobile app, hopefully that portion will be resolved soon. Are you getting any kind of error messages at all when sharing? Or is it just not appearing in your gallery when you go check? Have not tried until recently, but I'm having the same problem. I'm getting #coral, even on very small files. Not 100% certain our issues are the same, but figuring out one might help to figure out the other. Hey @Fightdude and @eithman - Do you mind sharing those sculpts you're failing to share with me? We'll take a look. Sorry about the errors, #Coral is sort of our catch all to just tell you it failed instead of failing silently. We've been trying to lock down all those edge cases but it's hard for us to reliably reproduce it. Sometimes I'll get 3 in a row and then not see it again for weeks. We usually chalk it up to internet connection instability. Not saving to uploads is something else entirely, are you on the most up to date build 1.3.3? We used to see issues with empty layers causing sculpts to fail to share. Are you seeing it on anything and everything? A good check to see if it's something in the sculpt is to just load a new scene and try to share the default sphere with no other changes and see what happens. sure, I'd be happy to if it would help. I have pasted a link to the Balloon Box sculpt that crashes facebook below. Mine turned out to be because my Medium install directory is on my large secondary drive. Moving it to my C:/ drive fixed the issue, but due to storage limitations, that's not viable long term. If possible, support for this setup style would be appreciated, but I don't know if that's possible. Has anyone found a fix for this? I cant seem to share my second model to Facebook. Once I press share it tells me it was uploaded but it really wasnt and I noticed that the Software\oculus-oculus-medium-retail\bin folder pops up for some reason... any tips? @fedus and @Rikheart, we haven't figured out the problem from Medium straight to the Facebook feed, but we do think there's a workaround. Can you try uploading your model to the web gallery, and then once it's uploaded, press the "Share to Facebook" flag? This will enable your model to show up as a 3D post on your Facebook feed. Let me know if that works for you. Hello , I've also been trying to upload my snowman to my web gallery but keep getting the #coral error. It is a big file 1.5 gigs. Any help would be appreciated. @Extremetruck420 ; Ah, seems like you're getting that error because the file limit for upload is 400MB - sorry that error code is not helpful!